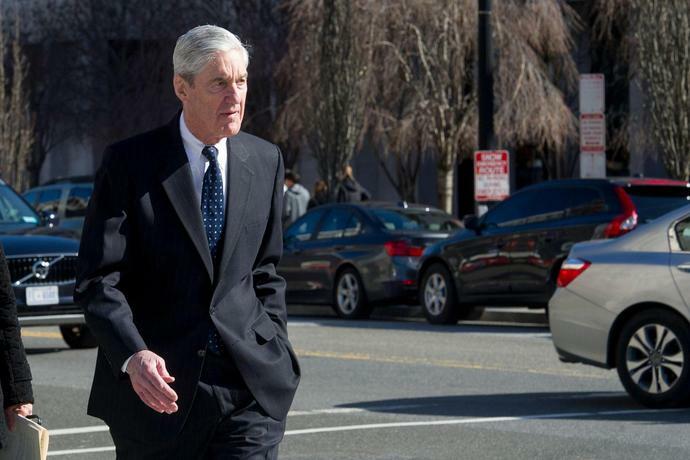 WASHINGTON - The Justice Department offered no indication on Monday of how soon it would reveal details from Robert Mueller's investigation into Russian election interference to members of Congress, who intensified their demands for access to the special counsel's full report. The leaders of six House committees said in a letter to Attorney General William Barr that they wanted to see Mueller's full report by April 2. They also asked him to turn over the evidence Mueller's investigators had gathered, saying the materials were "urgently needed by our committees to perform their duties under the Constitution." Barr issued a four-page summary of that report on Sunday, declaring that Mueller's 22-month inquiry had not found that President Donald Trump or his campaign conspired with Russian efforts to sway the 2016 election. On the separate issue of whether Trump had sought to thwart the investigation, Barr said he and Deputy Attorney General Rod Rosenstein determined that the president's conduct did not constitute a crime because Mueller's team did not reach a conclusion on whether Trump had obstructed justice. Trump and his allies swiftly declared victory in the inquiry that had cast a shadow over nearly all of his presidency to date. Congressional Democrats, however, said Barr's summary had only heightened their interest in obtaining a fuller account of how Mueller reached his conclusions. "If President Donald Trump says it 'wouldn't bother me' to release the full Mueller report, then Attorney General Barr and the administration should release the full report and underlying documents without any further delay," Senate Minority Leader Charles Schumer, D-N.Y., said on Twitter. "The American people deserve the full truth. Now." Schumer also pushed the Senate to vote on a measure calling for Mueller's report to be made public, a proposal that passed the House 420-0 this month. Senate Majority Leader Mitch McConnell, R-Ky., blocked the request, saying Barr and Mueller should be given time to review the report, and the attorney general has already said he plans to release it. A small team of Justice Department staffers is reviewing the report to determine which parts are based on grand jury testimony or would reveal information about other pending cases, subjects Barr has said the department is constrained to keep secret, according to an official who was not authorized to speak publicly. The department offered no clues on Monday about how long that review would last, or even about the size of the report Mueller had delivered. Sen. Dianne Feinstein, D-Calif., the ranking member of the Senate Judiciary Committee, on Monday sent a letter to Barr calling for the report's release. "A four-page summary ... with no underlying evidence or findings, is not adequate to accomplish our constitutional, legislative, and oversight responsibilities," Feinstein said. Democrats said they were particularly interested in Mueller's decision not to decide whether the president had committed obstruction, and how Barr could have reached his own conclusion so rapidly. A Justice Department official said that Mueller's team informed Barr and Rosenstein during a meeting three weeks ago that they could not reach a conclusion on whether Trump obstructed justice. "It was Bob Mueller's decision not to reach a conclusion on obstruction," the official said. "It was entirely Bob Mueller's decision." Barr, nominated by Trump to replace Jeff Sessions, is all but assured to be called to testify before Congress to explain his action, along with the special counsel in what is shaping up as a protracted political fight that could spill into 2020 presidential election cycle. "It's critical for the public and Congress to see the facts that Mueller actually found rather than just having to rely on Barr's conclusions, especially since it's pretty clear that there's some stuff in Mueller's report that supports the idea that there was obstruction of justice and some things that don't," said Randall Eliason, a former federal prosecutor and a law professor at George Washington University. "All of that needs to come out." Barr told lawmakers on Sunday the process won't be that simple. He said department lawyers would review the report to remove material that must remain secret, such as grand jury-related information. Then he said he would review it again to determine "what can be released in light of applicable law, regulations, and Department policies." Democrats have also pointed to recent history to suggest they are entitled to more. In September 2016, for example, the FBI released documents related to its investigation of Hillary Clinton's use of a personal email server during her time as secretary of state. Justice Department officials have since turned over 880,000 pages of documents on the Clinton email probe, Rep. Adam Schiff, D-Calif., chair of the House Intelligence Committee, said in an op-ed last week. "There's no excuse to bury information on Trump Russia and counterintelligence." Meanwhile, Mueller's office began winding down its work. Prosecutors who work there notified federal courts that they were withdrawing from a case involving former Trump campaign chairman Paul Manafort, to be replaced by prosecutors from the U.S. attorney's office in Washington.